I've been meaning to tell you about the book I am reading for my book club. 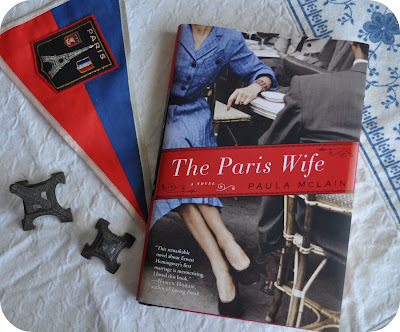 Have any of you read The Paris Wife yet? I have big plans to spend the weekend trying to relax (I've been a big stress ball lately) and I want to get taken away by this book. I'm participating in a blog day of silence, For Japan With Love, tomorrow. So, I'll wish you the happiest of weekends a bit early. Did you see the footage of the puppy? I worry so about the animals. I want you all to know that I would stay by your side too. Thats wonderful of you to be supporting the cause, im trying to do the same myself. I've donated a few dollars so far but ive been putting the word out with my family and friends for more help. The whole situation in japan has really left me speechless, just horrible devastation that continues to bring many tears. I just hope peace comes to all of those people and they get all the help they need. Spending all weekend reading a book sounds wonderful. I wish I could do the same. Too bad the hubs has plans to for me to help him outside all weekend. Kitty, the puppy and his friend were rescued and taken to a clinic where they received treatment! They are now in a warm & dry shelter being kept fed and loved until their owners are able to come for them.